Thus a characterization is the mask which hides the actor-individual. Protected by it he can lay bare his soul down to the last intimate detail. 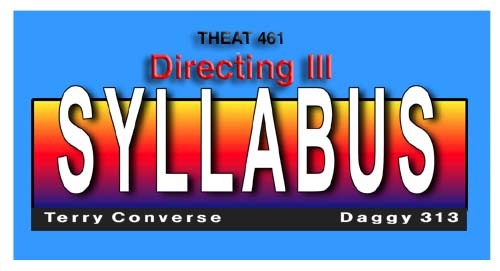 Building upon the foundations of Directing I and II, Theat461 is the capstone directing course of the department. As with the previous two directing courses, the workshop environment is designed to provide the student-director with a high level of experimentation in solving advanced problems. The overriding objective of performance III: Directing is to develop skills in directing non-realistic theatre. Whereas Directing II was focused on gaining confidence in directing representational, realistic theatre, Directing III focuses exclusively on gaining skills and confidence in directing presentational, stylistic performances. Since acting and directing are inextricably related disciplines, performance III: Directing is scheduled at the same time as Performance III: Acting in order to provide mutually beneficial training opportunities for both acting and directing students. At times the directing and acting classes will be held separately, but frequently they will be brought together to experiment with mutually challenging director/actor, collaborative exercises. Simultaneous scheduling provides both the acting and directing students of performance iii with a highly practical, experientially based, learning laboratory. Our primary training strategy for cultivating creative approaches to non-realistic theatre is via mask characterization. Both directors and actors will experiment extensively with neutral masks, life masks, and character masks. By experimenting with masks themselves, directors will come to realize the vast potential of mask training, learning for example, that masks help actors break out of their own personal rhythms and centers, expand preconceptions about a role, stimulate physical imagination, and bring greater variety to a character. Covering the face enables actors to hide from their individual persona, and temporarily separated from their own identify they and their directors can access new realms of inspiration. Having something to hide behind means, paradoxically, that they have no longer need to hide and can therefore take greater risks. Instead of imitating life in behavioral terms, mask characterization allows actors and directors to find very powerful dramatic expression. More than any other approach, mask work helps to jump start and sustain the student director's stylistic imagination. In many ways mask work is a follow through of the Silent Scene and Brecht Test approach of Directing I that was designed to sharpen visual skills and avoid the talking heads syndrome. Although the acting and directing components of performance iii are two separate courses of study, the intent is create a combined performance group that functions as a dynamic ensemble. With everyones combined ideas and energy, you will accomplish much more than you ever could alone. A workshop guide of creative Exercises and Projects. Colorado Springs: Meriwether publishing ltd., 1995 (ISBN: 1-56608-014-2). Northwestern University Press. 2006 ISBN: 0-8101-2093-3.
a Contact sheet (including phone numbers and hypertexted e-mail addresses of class members. this password to enter your information is: <playscript>. an on-line discussion board used for your Directors Talk about Directing postings. You need to have a minimum of two postings for each of the seven scenes performed in class, and two postings for each of the Myth Vision Performances. The overall intent of this activity is to literally amplify and add to our in-class discussions. your postings can be either new threads or follow-up responses). Profiles and Pictures of the directors and actors, intesting links, and of course much, much more." all set pieces and props are returned to their storage areas. no food or glassware for any reason is brought into the wadleigh theatre. For the mask work, tonal black or navy clothing is needed, such as sweats or leotards (no prints or patterns). It is essential that you have this clothing by Thurs. Aug. 27. Project C: Lighting design (due Dec.3) ......... 10 pts. Project D: Sound design (due Dec.3) ......... 10 pts. Project E: Poster design (due Dec.3) ......... 10 pts. Project F: Character Mask (due Dec.3) ........... 20 pts. Attendance at all classes is essential and expected. for each missed class 3 points will be subtracted from your total number of available points. Much of the time the class will be divided into teams. Directing students will at times be asked to act in other directors scenes. Watching plays is a wonderful way of learning more about directing. Students are expected to attend all final week, evening performances. Students are expected to function as crew heads for the final plays of other directors when needed. No make-up scene work will be permitted. A Life Mask Scene -- Part 1 Direct a given open scene using Thrust Staging. Scene 4: Dirty, Filthy Love Create a 3-5 minute scene utilizing either neutral or character masks where the characters are obsessive-compulsive and in conflict. The arena staged scene will based on the world of The Odyssey. PROP PHYSICALIZING Direct a 3 - 4 minute scene from The Arabian Nights. Same as Scene 5, only staged as a NO PROP version. Scene 7: Dress Rehearsal reh. begins after 10-Min. Plays. Strike (all must attend) performance begins at 7:00 P.M.
Directors and actors should discover the "trigger" that brings about the metamorphosis into the other creature, and the trigger that reverses the process. The challenge is to apply the concepts of Scene 1 to an actual scene from Mary Zimmerman's Metamorphoses. Haiku are lively brief poetic pieces used as a challenging capstone to the Neutral Mask identification exercises. A successive flow of images and/or movement in a haiku involves an emotional identification with nature and/or a transition, transformation, or metamorphosis. Such a metamorphosis can be a transformation from image to image, from objective to subjective points of view, from a close up to a long shot; from images presented through a screen of human observer or narrator to images presented directly seemingly without human intervention. The challenge is to apply the concepts of Scene 2 to an actual scene from Mary Zimmerman's Metamorphoses. You will be provided with a script-imagine that, an actual script! The provided text is, in effect, an open scene and the idea is to use the same script to perform two very different scenes. In addition to being given a script, you'll also be given specific details relating to the who, what, and where of each scene. With both scenes, the overall idea is to explore the public and private facets of the characters' personalities. The actors will be wearing life masks that we created in class, although they will be working in life masks other than their own. In one scene, the actual life mask represents the public face of the character, and in other scene the same mask represents the private face. Both scenes need to be stylized, and the more the non-realistic style harmonizes and/or illuminates the public and private, the better. Create a 3-5 minute scene utilizing either neutral or character masks where the characters are obsessive compulsive and in conflict. The arena staged scene will be based on the world of The Odyssey. A scene from The Odyssey is performed two different ways: first realistically, then as a prop physicalization. In prop physicalizing, the challenge is to find physical metaphors in movement and gesture that channel impulses in unconventional, yet highly revealing ways. Very similar to Scene 5, except no actual "props" were used. In addition to finding a picture and a musical selection that epitomizes your Final Play, the overall intent of this project is to simulate a production meeting in which the director discusses his production concept with the set and costume designer. Create a prompt book (your director's notebook) for your final production. See pp. 277-283 in the text for a complete explanation of how to create an effective Prompt Book.